Armagh shrugged off a difficult start at Croke Park to waltz past Laois on a 2-17 to 1-11 scoreline and book their place in the All-Ireland SFC semi-finals. The Orchard County's focus will now shift to next Saturday's clash between Dublin and Tyrone, with the winners set to face Armagh. 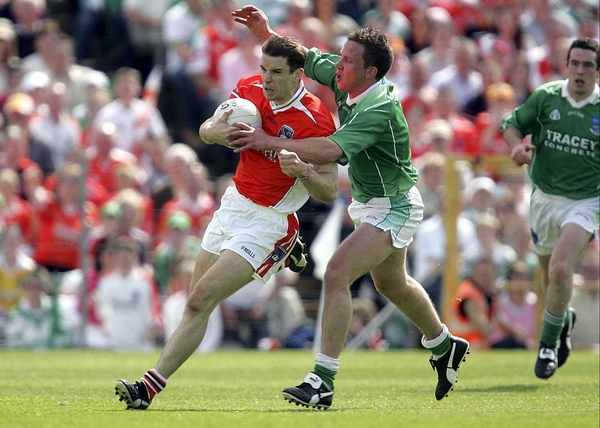 On this type of form nobody will fancy taking on Armagh, not even Tyrone who have plenty to make up for after their controversial Ulster final replay defeat. Armagh were simply awesome when they got going and racked up a stunning 2-17, their highest tally of the season. Afterwards boss Joe Kernan displayed an unnerving appetite for destruction by insisting they would still have to up their game for the semis. They even saw off Laois without captain Kieran McGeeney, who cried off before the game with a hamstring strain and was replaced by Aidan O'Rourke. Kernan said they could have called on him if they really needed but, as it turned out, they didn't. Save for an early fright when Laois ran 0-6 to 0-3 ahead by the quarter hour mark, Armagh were never really troubled. Ultimately, the combined forces of Stevie McDonnell and Oisin McConville, who registered 2-8 between them, sent Armagh hurtling into the final four yet again. McConville's second point on the half-hour mark was crucial, as it put the sides back at 0-6 apiece and stamped out Laois' early insurgence. Poor Laois were made to count the cost of a string of wides and Ronan Clarke moved Armagh two points clear before McDonnell's goal in first-half injury-time. Without really breaking out Armagh now led 1-8 to 0-6 and, in hindsight, it was all over for the plucky Leinster men. If this is Mick O'Dwyer's last stand in management then the second-half was a disturbing way for the Kerry legend to bow out. McDonnell, Aaron Kernan, Martin O'Rourke and Paul McGrane all hit points to open up a huge 1-13 to 0-7 lead by the 50th minute. Laois were gifted a goal when Barry Brennan's scuffed shot slipped through the legs of Armagh 'keeper Paul Hearty, but it was a fleeting setback. McDonnell and McConville both hit a brace of points each before the latter rounded Laois 'keeper Fergal Byron and slotted home their second goal in the 67th minute to seal what turned out to be a facile win. Armagh: P Hearty; C McKeever, F Bellew, E McNulty; A Kernan (0-2, 2f), A O'Rourke, A Mallon; P Loughran, P McGrane (0-1); M O'Rourke (0-2), J McEntee (0-1), B Mallon; O McConville (1-3, 2f), R Clarke (0-3), S McDonnell (1-5, 1f). Subs: T McEntee (for J McEntee 53 mins), K McElvanna (for A O'Rourke 64 mins), S Kernan (for B Mallon 64 mins), A McCann (for Kernan 65 mins), M Mackin (for M O'Rourke 68 mins). 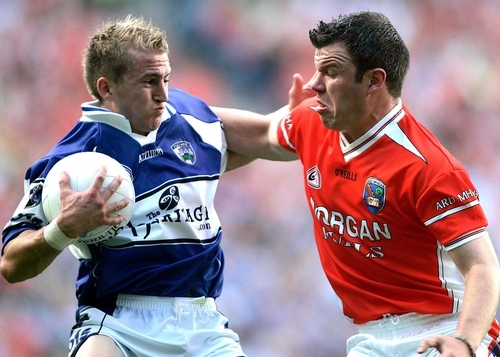 Laois: F Byron; A Fennelly, D Rooney, J Higgins; C Begley, T Kelly, P McMahon; P Clancy (0-1), N Garvan; R Munnelly (0-4, 3f), B Brennan (1-1), B Sheehan (0-3); D Brennan, S Kelly (0-1), C McDonald. Subs: G Kavanagh (for McDonald h-t), C Conway (0-1) (for S Kelly h-t), K Fitzpatrick (for D Brennan 51mins), M Dunne (for Garvan 60 mins).